A little sweet heat works its magic while these grill, producing flavourful barbecue ribs with a zing of citrus. 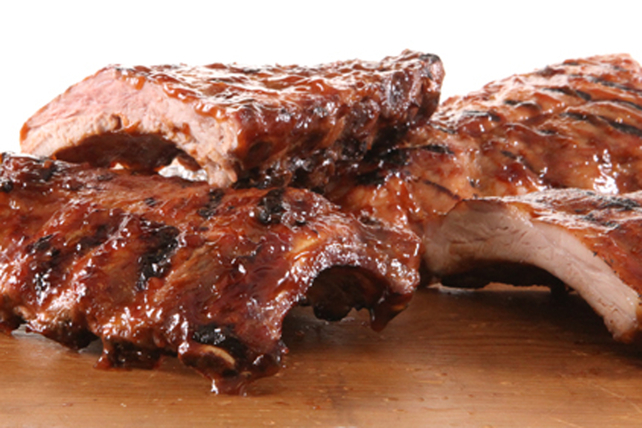 Using a foil-pack ensures these pork ribs are juicy and tender. Mix first 3 ingredients until blended. Place half the ribs in single layer in centre of large sheet of heavy-duty foil. Bring up long sides of foil. Double fold short ends to seal, leaving top open. Place 3 or 4 ice cubes in packet. Double fold top to seal, leaving room for heat circulation inside. Repeat to make second packet. Grill 45 min. to 1 hour or until ribs are done. Remove ribs from foil; place on barbecue grate. Brush with barbecue sauce mixture. Grill 10 min., turning occasionally and brushing with remaining barbecue sauce mixture. For a sweet variation, brush cooked ribs with a mixture of 1/4 cup each Bull's-Eye Barbecue Sauce or Kraft Original BBQ Sauce, Heinz Tomato Ketchup and Kraft Pure Apricot Jam for the last 10 min. of the grilling time. Prepare using Kraft Original BBQ Sauce.